For some time I have been talking about Itoh peonies, crosses between herbaceous and tree peonies. They are expensive still but oh so beautiful. 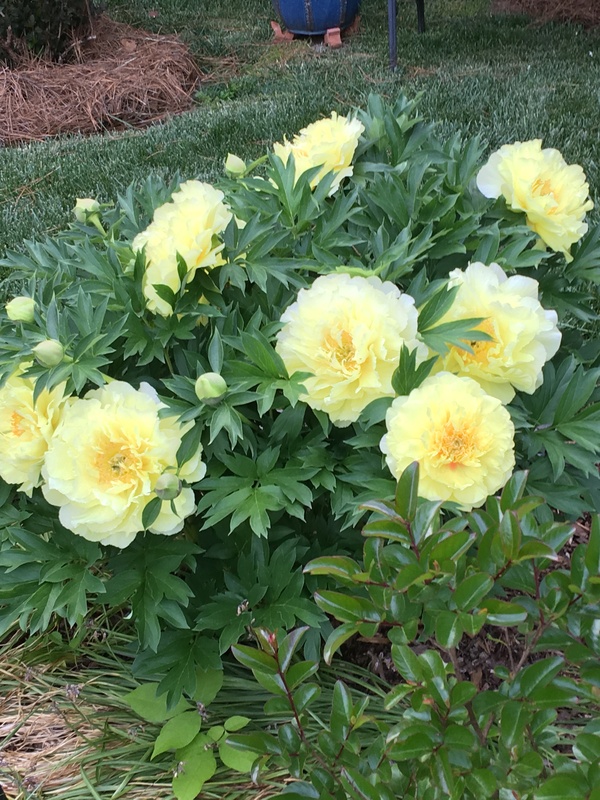 My absolute favorite is ‘Bartzella,’ an iconic yellow peony that makes all the visitors to my garden go crazy. It is only fitting then that I dedicate this week’s vase to the lovely ‘Bartzella.’ She needs no supporting cast. They make for a powerful display in the garden. One of the wonderful characteristics of Itoh peonies is that they stay upright, even with a heavy bloom in rain and wind. We have just had over five inches of heavy rain in the last 24 hours, and ‘Bartzella’ is still standing tall, while my herbaceous peonies are drooping. Let me invite you to visit Cathy at Rambling in the Garden to see what she and others responding to her invitation to share something lovely from our gardens in a vase each Monday. This entry was posted in Gardening, In a Vase on Monday and tagged Bartzella, Itoh peony, Rambling in the Garden. Bookmark the permalink. So gorgeous John. Would this be a good time to plant Itoh peonies? My experience with them (just a few years) is that it would be best to wait till fall. Mine have struggled to get going over a hot summer…but eventually made it. It may be that long hours of full sun may have been the problem. These are lovely! Miss you. Well, come on down. We miss you too. I learned about Itoh’s from you. This is so amazing. 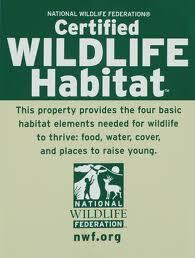 I hope you will be able to find and plant a few in your garden. Fabulous! I remember being so delighted by this one last year too. 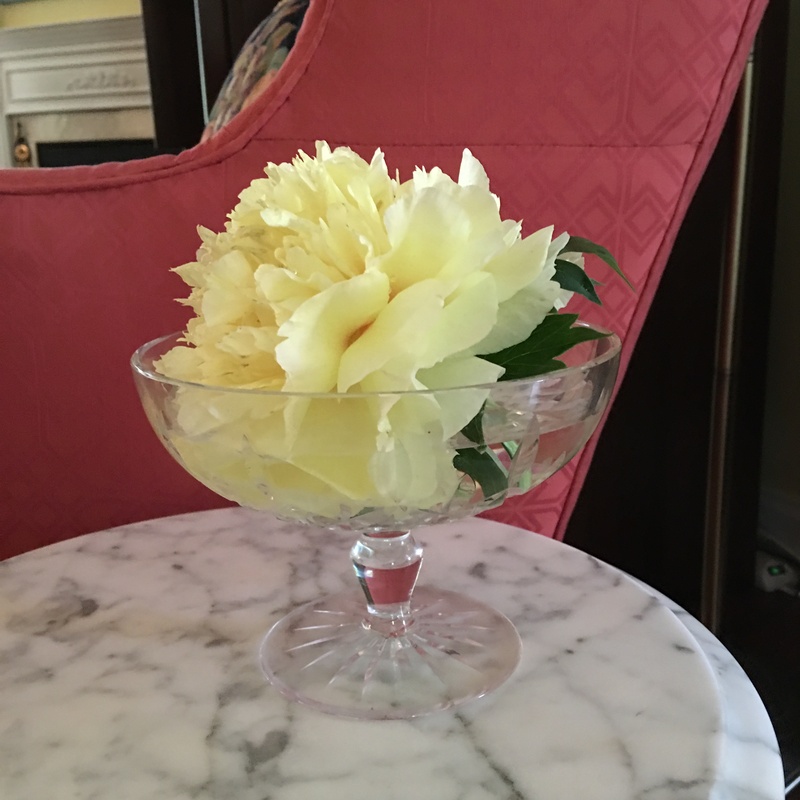 It inspired me to source a yellow Itoh peony and I found one called Shining Light. If it flowers this year I will be sure to share it! Thanks John! I’ glad you found one. Will be looking forward to seeing it. I know you will be pleased. Just added this one to my plant shopping wish list! I am confident you will be excited when you see it in bloom. You might look for Cora Louise, which was recommended in Fine Gardening. I haven’t seen it personally, but the write up was enticing. There are few things in our world that share their beauty more than flowers. Very well said. Thank you, Scott. There is something about digging in the soil. It’s in our genes, I suppose. An aging cousin grew on a farm and then moved to the city for the job and the money. However, in every place he has lived he immediately begins farming no matter if he has a square foot or ten yards at his disposal. Outside his back door he built a trellis where his cucumbers grow. His wife refers to it as his prickle patch. Wow. Love the nice straw mulching in the background, too. Thanks, J.B. You are most observant. I remember when you showed your Itoh peonies last year I was so impressed, googled, and swore to source someone who supplied over here. Thanks for the reminder. It is a sumptious flower indeed, and stands superbly on its own! I hope you can find one. It is one of my very top favorites. Thank you, Cathy. I continue to be struck with the way hybridization has changed my gardening habits. Itoh peonies. Reblooming iris. Reblooming azaleas. Reblooming daylilies. Reblooming hydrangeas. All the new heucheras. The list goes on, and the impact on our gardens is revolutionary.